With the school holidays quickly approaching. Pet Insurance Australia investigates some fun ideas to share the extra time at home with your beloved pets. Pets simply adore the school holidays. With the kids back at home, their forever playmates and constant companions are available 24/7. It’s no wonder our pets love this time of year. The extra cuddles and paly sessions make for an interesting and fulfilled day of adventure and companionship, which is pure heaven to our pets. So, what are the best types of activities for pets over the school holidays to take full advantage of this great time together? Make sure you pack enough water and food for you adventure, and don’t forget a towel particularly if you are visiting anywhere with water. Ensure you get all the info you need, including if the area is an off-leash area. Some reserves and beaches will only be off-leash during certain times of the day and year. A good sturdy lead and collar will also be needed and also your trusty poop-bags. Always ensure your microchip details and registration is up-to-date. Teach and Old Dog New Tricks! “MUM I’m BORED!” is a typical sentence echoed around during the school holidays. A great way to beat the boredom is to set the kids a task of teaching the family dog or cat, a trick. 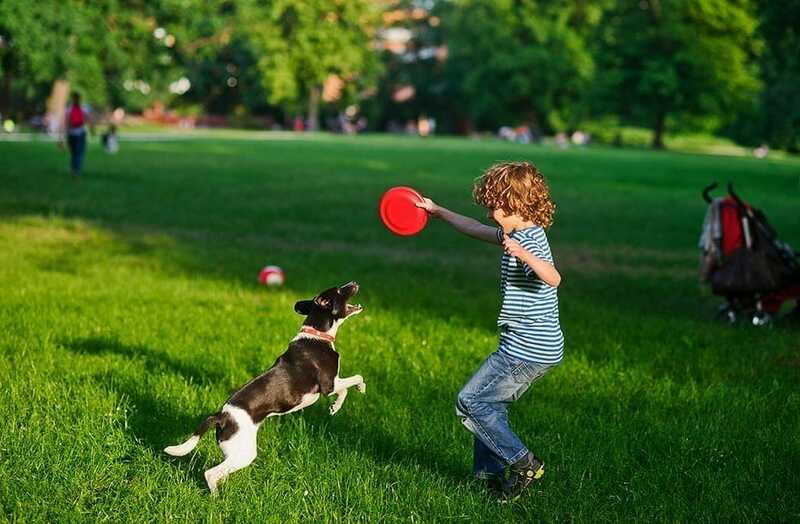 There are plenty of fun training tricks you can teach your pet, plus this type of training is super fun for your kids and pet, and also increase the wonderful bond they share. For dogs; learning new things can help with boredom and general behaviour. Children will feel a huge amount of pride teaching their pet something new. You can happily teach fun training indoors during rainy days. This can be anything from the basics such as “fetch” to teaching your dog how to “play dead” or more advanced dog training such as target training. Your imagination and creativity are really the limit with training fun. Do some research and write some ‘training goals’ for the school holidays. This school holidays many families will also be celebrating Easter. This is the time of year to take extra care, particularly with dogs, who will simply love to devour a chocolate egg… wrapping and all! Chocolate contains a very toxic agent to pets, known as theobromine. As little as 100-150 milligrams per kilogram of bodyweight will cause toxicity in dogs. This means that if you have a 30kg dog as little as 3000mg of theobromine could be fatal. The rate of theobromine increases in darker chocolate and how the chocolate was made and the caffeine component. If you suspect your dog is in danger call your local veterinary clinic and seek out professional advice quickly. It’s a good time of year to remind the children of the importance of keeping their dogs safe from chocolate and keep those delicious chocolate eggs, up and out of reach from Rovers impressive nose! For cats -the popular Easter flower; Lilies are the main culprit when it comes poisoning incidents. It’s a good idea to keep this in mind when purchasing flowers over Easter for a known cat owner. Many novelty shops now sell special containers to hide eggs inside. So, the Easter Bunny can also help keep the family dog safe when on the annual egg hunt. Why not add some pet treats along the way to allow your dog to celebrate in all the fun?